Marine Corps Corporal John R. Stalvey, from Brunswick, Georgia was assigned to 3rd Battalion, 6th Marine Regiment, 2nd Marine Division, II Marine Expeditionary Force, Camp Lejeune, North Carolina. 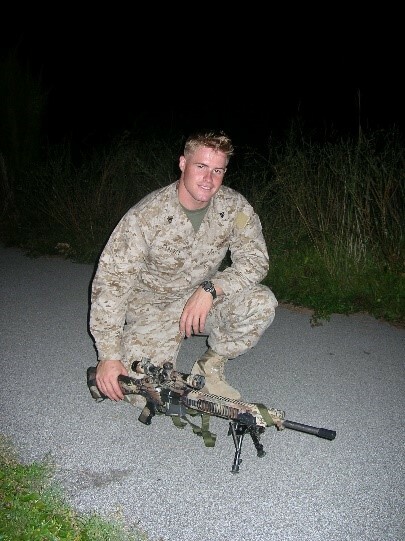 In 2005, he graduated from Marine sniper school in Quantico, Virginia and had been in Iraq for about a month in support of Operation Iron Fist in Karabilah, Iraq. On October 5, 2005 the 22-year-old’s team was conducting combat operations against enemy forces when the Humvee he was driving struck an improvised explosive device, taking his life and injuring the three other Marines in the vehicle with him. Born in Jacksonville, Florida, John Salvey spent most of his life in Brunswick, Georgia where he was a graduate of Faith Baptist Christian Academy in 2001. Shortly after completing high school he moved to Conroe, Texas to live with his aunt and uncle. He joined the military following the terrorist attacks on 9/11 and had been a Marine for four years. Along with deployments to Afghanistan and Iraq, Salvey also had tours of duty in Cuba and Africa. Cpl. Stalvey deployed to Afghanistan in 2004 and upon his return to the states, was awarded the marine Corps Achievement Medal for Bravery for driving 16 Marines out of harm’s way in an improvised explosive device blast. Corporal Stalvey was described as, “a Christian who loved to hunt, fish, draw, and sculpt.” His aunt said he was the most patriotic person she had ever known. Although he wasn’t married, he’d met a special young woman whom he had become very serious about.